In part 1 and part 2 of this series, we have learned how to solve number age problems by working backward. In this post, we are going to learn how to solve backward using inverse operations. Recall that multiplication and division are inverse operations and addition and subtraction are inverse operations. A number is multiplied by 4 and then, 3 is added to the product. The result is 31. What is the number? The key phrases in this problem are (1) multiplied by 4 and (2) added to (3) the result is 31. Since we are working backward, we start with 31, and then find the inverse of “added to 3” which is “subtract 3.” So, 31 – 3 = 28. Next, we find the inverse of “multiplied by 4,” which is “divided by 4.” So, 28/4 = 7. So, the answer to this problem is 7. Think of a number. Divide it by 8. Then subtract 4 from the quotient. The result is 5. What is the number? The key phrases in this problem are (1) divided by 8 (2) subtract 4 and (3) the result is (3) the result is 5. We start with the result which is 5 and find the inverse of “subtract 4” which is “add 4.” So, 5 + 4 = 9. Next, we find the inverse of “divide by 8” which is “multiply by 8.” So, 9(8) = 72. So, the correct answer is 72. Check: 72/8 – 4 = 9 – 4 = 5. In the next post, we will discuss more about solving math word problems by working backward. In the previous post, we have learned how to solve number problems by working backward. In this post, we discuss age problems. We already had 2 examples in the previous post in this series, so we start with the third example. Arvin is 5 years older than Michael. The sum of their ages is 37. What are their ages? 37 – 5 = 32. Now, their ages are equal, so we can divide the sum by 2. That is 32 ÷ 2 = 16. This means that the younger person is 16 since we subtracted 5 from Arvin’s age. Therefore, Michael is 16 and Arvin is 16 + 5 = 21. 16 + 21 = 37. Mia is 3 years older than Pia. In 4 years, the sum of their ages is 35. What are their ages? There are two of them and we added 4 to both ages, so subtracting 8 from 35 (the sum) will determine the sum of their present age. That is 35 – 8 = 27 is the sum of their present age. Next, Mia is 3 years older than Pia, so if we subtract 3 from the sum of their present age, their ages will be equal. So, 27 – 3 = 24. We can now divide the sum of their ages by 2. That is 24/2 = 12. This means that 12 is the age of the younger person because we subtracted 3 from the age of the older person. So, Pia is 12 and Mia is 15. Check 12 + 15 = 22. In the next post, we will discuss more problems that can be solved by working backward. Most of us would always take a pen and solve for x if we see word problems. But did you know that you can solve them by working backward or even mentally? In this post, I am going to teach you some techniques on solving problems by working backward. Example 1: One number is three more than the other. Their sum is 45. What are the numbers? In the given, one number is 3 more than the other. This means that if you subtract 3 from the larger number they will be equal. Note that if we subtract 3 from one of the numbers, then we should also subtract 3 from their sum. Therefore, their sum will be 45 – 3 = 42. Since the numbers are equal, we now divide the sum by 2. That is, 42/2 = 21. So, the smaller number is 21 and the larger is 21 + 3 = 24. 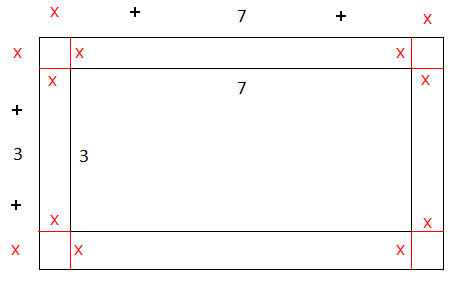 Example 2: One number is 5 less than the other. Their sum is 43. What is the smaller number? This is very similar to Example 1. Here, one number is 5 less than the other; so, if we add 5 to the smaller number, they will be equal. If we add 5 to the smaller number, we should also add 5 to their sum. Therefore, their sum will be 43 + 5 = 48. Since the two numbers are equal, we can divide the sum by 2. That is 48/2 = 24. Since we added 5, it means that 24 is the larger number. So, the smaller number is 24 – 5 = 19. In the next post, we are going to discuss more examples.